We invite you to explore India - the Land with infinite beauty ! Whether you soar high into Himalayas or peer under the ruins of the Ancient monuments dotting the landscape of India, you will cherish the experience long after your visit ! This India Travel Guide on Poondi Madha Basilica is free from any commercial interest! This site is dedicated to promote India - the vast subcontinent, its glorious past, magnificent landscape and its infinite variety. 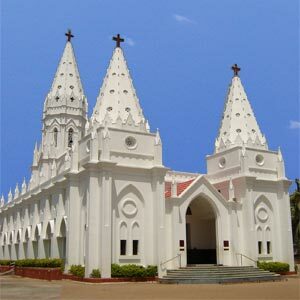 Our Lady of Lourdes Basilica, Poondi, is a Catholic pilgrimage centre located in Tamil Nadu, South India. It is popularly referred to as Poodi Madha Basilica. Located in the pastoral settings of Poondi village, this church was raised to a minor basilica on 3rd August 1999. Situated between the rivers Cauvery and Colleroon in Thiruvaiyaru taluk of Thanjavur district, Poondi can be reached by road from Trichy. A great Italian Jesuit missionary Rev. Fr. Constantine Joseph Beschi S.J. popularly known as 'Veeramamunivar' built a church and named it as the church of 'Mary Queen of Immaculate Conception' in the beginning of the eighteenth century (1714-1718). Father Constantine Joseph Beschi - mastered the Tamil language and wrote many literary work in Tamil, composed poetry and compiled Tamil-Latin dictionary. He was influenced by Hindu traditions and borrowed heavily from the Hindu temples when he built the churches in Tamil Nadu. The statue of the miraculous Lady of Poondi is placed in this dome in the church. This miraculous statue is one among the three statues that were made in France. The legend goes that a bright fire was seen burning within the church at night. The priest and some villagers opened the doors but did not find any source for the miraculous glow, which remained for years. News of this Divine Presence spread and thousands began to visit the Church of Our Lady of Lourdes. Rev. Fr. Lourdes Xavier, Parish Priest of the church in 1955 noticed the dilapidated state of the central roof and consulted an engineer. The engineer said that except for the central roof, the rest of the structure was quite strong. He recommended demolishing only the roof. The Father prayed to the Mother and he got a vision of the Mother. The roof of the church collapsed on its own on a rainy day however it left behind every other structure intact thus saving the demolishing cost. Gradually this shrine of the Mother gained in popularity as the Poondi Matha shrine, matha being mother in Tamil. This shrine was declared as Minor Basilica by Pope John Paul II and became the fourth basilica in Tamil Nadu. The imposing structure of the shrine is a blend of Gothic and French architecture. The key aspect of the structure is the row of statues of the twelve disciples of Jesus Christ. Apart from this, the relic of the original cross/true cross (the one on which Christ was crucified) is also kept at the Poondi Madha Basilica. On the feast of the Holy Cross, there is a process of the relic followed by a mass. This is held on the 5th Friday of Lent. The annual fest is celebrated between May 6 and 15. The feast of Mother Mary is celebrated on September 8. There is a special Novena at 9.30 am on the first Saturdays of the month. Another novena mass is held at 5 pm after the car procession.